It did not require great perspicacity to predict that SSI2009 would not be as well attended as last year's show. Things are tough all over. In any case, as I write this, on Saturday evening on a train en route to Torontoyes, I manage to catch the train this time!the show still has another day to go, and, as Michel Plante, with Sarah Tremblay the SSI's organizers, admitted, what often makes or breaks a show like this is the Sunday attendance. 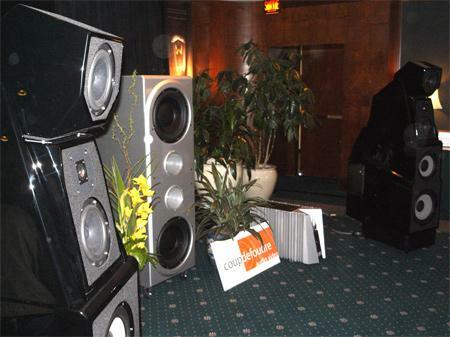 Okay, so the system in the big room from Montreal dealer Coup de Foudre was very expensive, and the room's acoustics I knew from the 2008 Show were excellent, but the sound was both my best at show and the best I heard in that room. Not only did Peter McGrath's high-resolution recordings, played back from his Sound Devices recorder feeding the very promising Playback Designs' D/A processor, reproduce with extraordinary dynamics and a superbly transparent window into the soundstage, my own recordings sounded the best I have experienced, with the audiophile attributes supporting/reinforcing rather than getting in the way of the music. And that was from CD! Wilson Audio Specialties' Peter McGrath (second from left) is embraced by the crew of Coup de Foudre (lr): Jennifer ("Just Jennifer. No surname. You may have heard of me. "), Graeme Humfrey, and Erik Fortier. 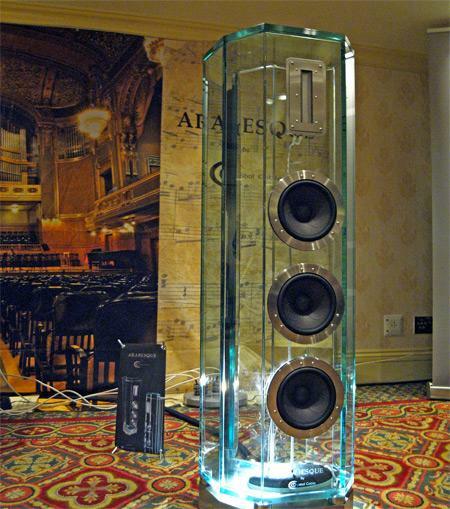 I first heard the prototypes of the almost-all-glass Arabesque from Dutch wire manufacturer Crystal Cable at the 2009 CES, where they produced sound in the Audio Basics room that belied my negative expectations. Demmed at SSI with Simaudio 5.3 series CD player and amplification, the Arabesques, now in full production, again produced a promising sound. With my my recording of "The Mooche," from Editor's Choice, the Arabesques put me squarely in the church acoustic of Chad Kassem's Blue Heaven Studio in Kansas, where the recording was made. "Air Motion" because the Adamsfamiliar to me from the German company's strong showing at pro-audio showsfeature modern versions of the Oskar Heil-designed "Air Motion Transformer" higher-frequency drive-units that a brief period of popularity in the 1970s. This uses a corrugated aluminum-foil diaphragm that moves somewhat like an accordian bellows, alternately squeezing and stretching the air between the folds. Adam, who is entering the North American high-end audio market, was proudly showing its top-model Tensor series at SSI, but I was also impressed by the active A5 shown in the photo, which crosses the AMT tweeter over to a moving-coil woofer at 2.2kHz and costs just $900/pair. 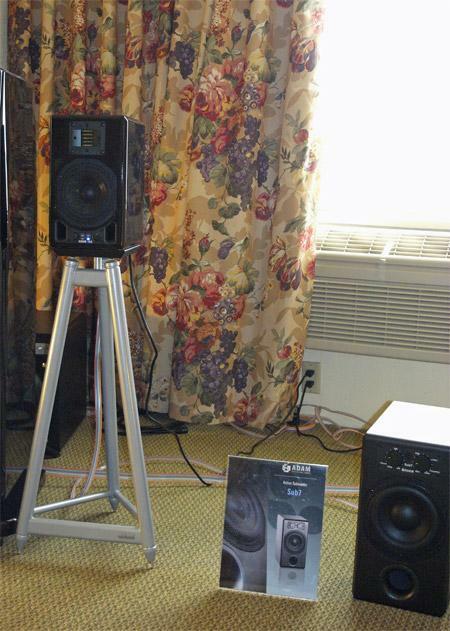 With the $600 Sub 7 active woofer also shown in the photo, a pair of Adam A5s would make the basis for an affordable high-quality system. 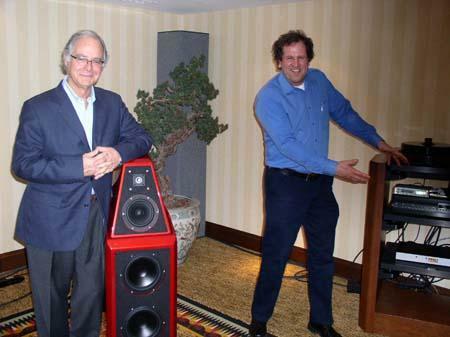 Asked to name the top three drawbacks of electrostatic loudspeakers, the knowledgeable audiophile will listnot necessarily in this orderrestricted listening area, inability to play loud, and limited bass extension. Although the last criticism can still be applied to the new MartinLogan CLX (its claimed bass 3dB point is 56Hz), the speaker's design has gone a major way toward addressing the other two criticisms. René Laflamme's recordings on the Fidelio label have always been favorites of mine, though his choice of repertoirelike the new "It's a Small World" projectsometimes cause my eyebrows to raise. SSI was my first chance to hear high-resolution versions of some Fidelio recordings, played back from René's laptop feeding data via asynchronous USB to the dCS Scarlatti upsampler set to do nothing other than translate the USB datastream to AES/EBU at 96kHz to drive the dCS Elgar Plus D/A. As this has a volume control it was connected direcrtly to a pair of Nagra VPA tube monoblocks which in turn drove the Verity Sarastro 2 speakers that Fred Kaplan reviewed for Stereophile in April. Cabling was all-Shunyata. 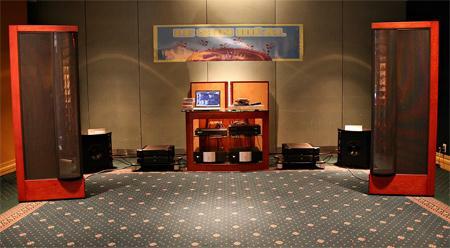 René uses all-tube microphones and records directly to a Pyramix digital audio workstation. The sound of a transcription for brass and organ of "Mars" from Holst's The Planets was to die for on this system, one of my "best of shows." 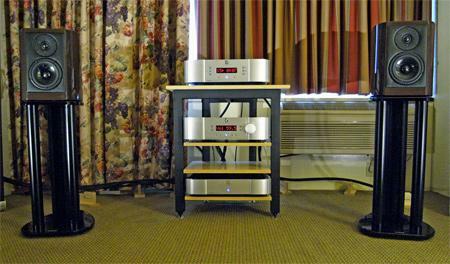 SSI seems to feature a higher proportion than usual of rooms sponsored by high-end dealers, and one of the best sounds I experienced was in the room from Montreal dealer Son-Or Filtronique. 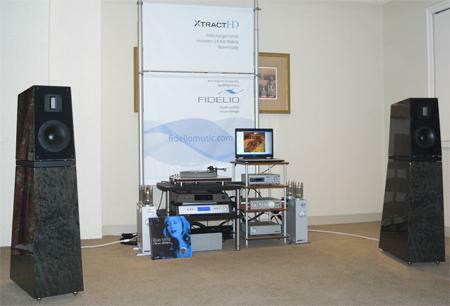 The top-line, multi-box dCS Scarlatti SACD front-end (soon to be reviewed for Stereophile by Mikey Fremer) drove Audio Research electronics (Reference 3 preamp and Reference 110 amplifier) with speakers the impressive Kliimt from Vienna Acoustics. Cabling was all Shunyata. Corinne Bailey Rae's perfomance of Joni Mitchell's "River," from the Herbie Hancock CD of the same name, was reproduced with midrange to die for, though the low frequencies were a touch over-ripe, I thought. Lafleur's X-1 bookshelf ($14,000/pair) was one of the hits of last year's Montreal Show despite the poor acoustics of the room they were being shown in, so I was looking forward to taking a further listen this year in a better room. Driven by an all-Simaudio Evolution series rigAndromeda CD player and i-7 integrated amplifierthe X1s did indeed produce a superby detailed, natural-sounding midrange and treble, but the low frequencies seemed a little shelved down in absolute terms, I thought. 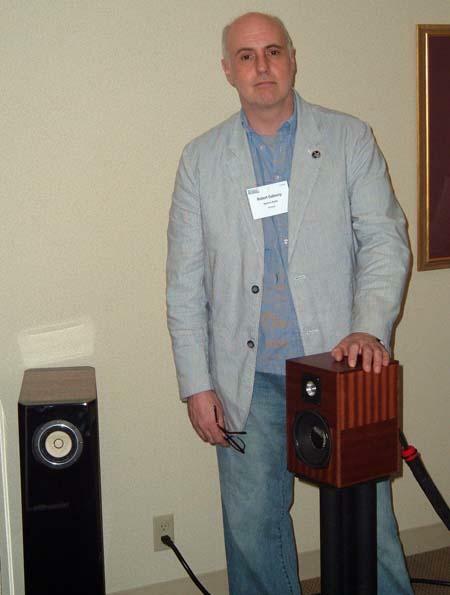 Robert Gaboury stands with his little Gemme Audio Soprano. 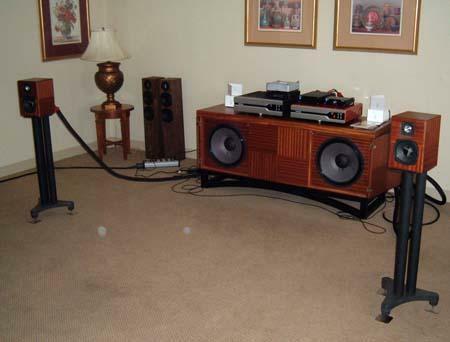 The Sashas of Obad Imports suggested that I check out the Gemme Audio room, where a Neodio amplifier had been replaced by a prototype KingRex 50W Tripath amplifier. 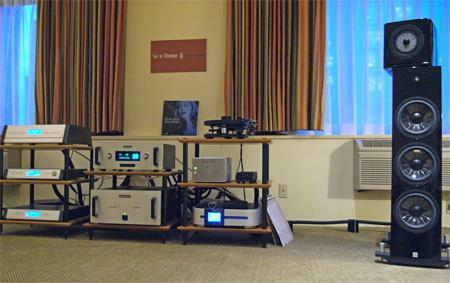 Gemme Audio's Robert Gaboury had his special Phenix Green Gem system ($37,000 CAN) on display, along with a Neodio CD player, and Blueberry Hill Audio cables. 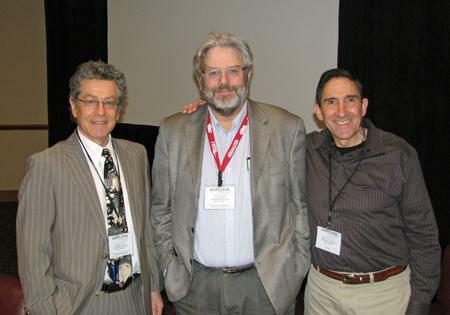 ...was how SSI organizer Michel Plante had billed our "Ask the Editors" session, and (from left to right), Stephen Mejias, Robert Deutsch, and Art Dudley joined me in an animated discussion. Topics covered included the vinyl revivial, whether there is still a role for paper magazines in an Internet world, how does someone become a reviewer, and will Blu-ray be a viable medium for high-quality music. 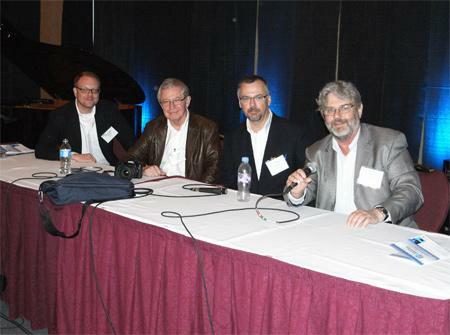 Stereophile's star blogger Stephen Mejias hold forth at the debate on why he is in love with vinyl, while Robert Deutsch (center) and Art Dudley (right) wait to chime in with their opinions. 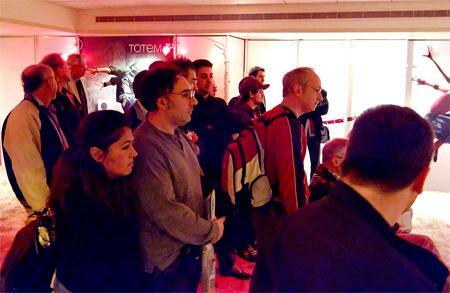 An Audio Show wouldn't be an Audio Show without live music, to allow Showgoers to recalibrate their ears. 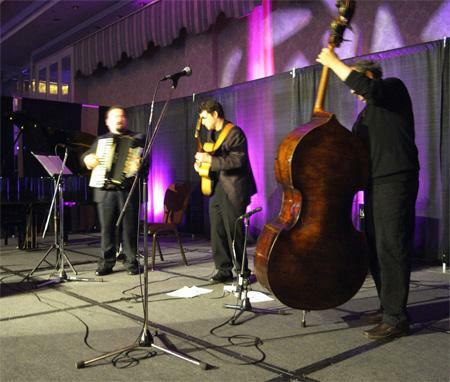 The 2009 SSI featured two concerts, one by jazz pianist and singer Anne Bisson, the other by the Michel Donato Trio, seen here, with Donato on double bass, Jon Gearey on guitar, and Marin Nasturica on accordion. Both acts have audiophile sound-quality CDs available from Montreal's Fidelio Audio, and other news from SSI was that these recordings are now available as 24-bit, 96kHz files. 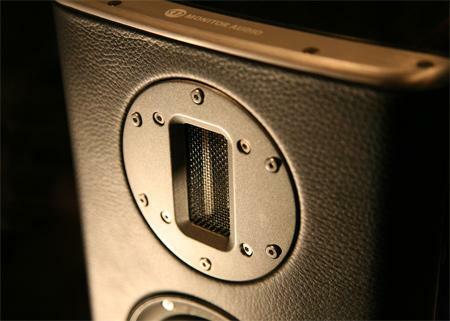 Stereophile readers often wonder about how products are chosen for review, and, as I said at the SSI "Ask the Editors" panel discussion, the Monitor Audio Platinum 200 provides a case in point.